The U.S. bank prime rate remained at 3.25 percent in the first half of May. While the prime rate was unchanged, bond market interest rates rose sharply in early May on renewed optimism about the economy. This optimism was triggered primarily by a report on employment growth for April, which not only showed more new jobs than expected for that month, but which also included strong upward revisions of previously-released numbers for February and March. Economic strength often pushes interest rates higher, as those rates reflect the increased demand for capital in a growing economy. The inflation that may come with accelerating growth can also be a factor influencing rates higher. On top of those naturally-occurring conditions, interest rates may be especially sensitive to signs of growth in the present situation because the Federal Reserve has taken such extraordinary measures to hold interest rates down. This has been in an attempt to stimulate the economy, so if the economy shows sustained improvement the Fed should start easing back on those measures, allowing rates to rise. For credit card customers, while an improving economy may bring higher rates, the benefit is that it should also make credit more readily available, as credit card companies gain more confidence about bringing on new customers and extending credit limits. With consumer rewards credit card rates rising while consumer non-rewards rates held steady, the potential cost of rewards programs increased slightly. However, this cost varies from program to program, and the biggest variable in determining the cost of a rewards program is the extent to which the customer carries balances that are charged interest from month to month. Still, any change in the relationship between reward and non-rewards interest rates is a reminder that when deciding whether to choose a rewards card, customers should consider the costs as well as the rewards being offered. Interest rates on student credit cards have been stable, changing just once in the past six months, and not since late February. 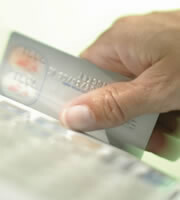 Both business non-rewards and rewards credit cards showed no changes in the first half of May. Business non-rewards cards have now remained unchanged for over a year, while business rewards cards have changed only slightly since late February. This type of stability should help business owners make clear decisions about their corporate credit cards, allowing them time to research and compare different cards. Similarly, this stability creates a good environment to evaluate the cost/benefit of rewards programs, because with little change in credit card rates the numbers involved in this analysis have been very dependable. The difference between credit card rates for customers with excellent credit and rates for those with average credit narrowed slightly in the first half of May, dropping by 4 basis points to 4.13 percent. A narrowing of this spread is consistent with the economic environment of early May, which saw interest rates rise on unexpectedly strong employment news. Basically, a narrowing of the spread between credit card rate tiers means that while interest rates are rising in general, with a strengthening economy credit card companies are not showing any increase in credit concerns. This allowed the higher consumer rate tier -- i.e., rates for people with compromised credit histories -- to hold firm even while the lower rate tier rose. 0 Responses to "Consumer rewards credit card rates edge upward"